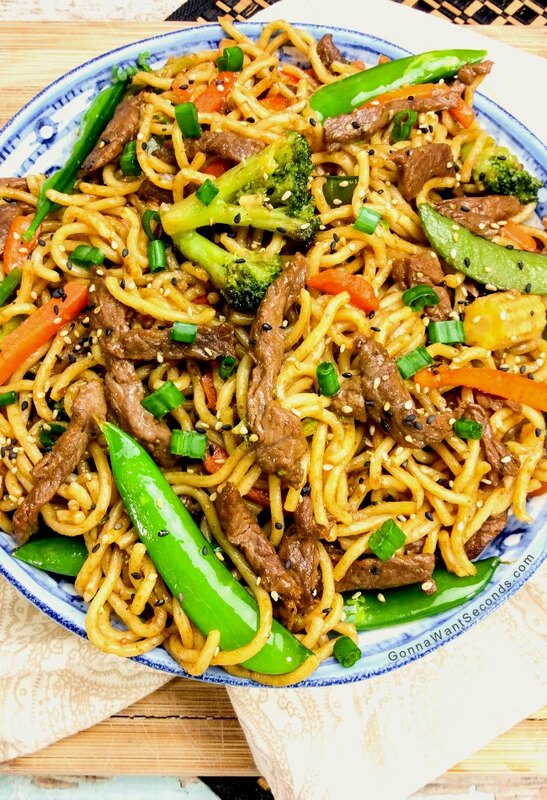 Easy Beef Chow Mein Recipe-Our Recipe Is Quick, Easy And Delish! Our Easy, Cantonese Inspired, Beef Chow Mein Is Loaded With Crisp Veggies, Tender Beef, and Noodles. Asian Medley Frozen Veggies Make The Prep Quick & Easy! Anyone else thinks noodles should be an official food group? Chewy udon, tender tagliatelle, delicate spaetzli . . . this class of soft, doughy delights is just as essential as any of the other groups, right?! Italians aren’t the only ones who have noodles down to a science. Asian cuisine does too, and all that textural magic makes this one killer dish. It’s time for some Beef Chow Mein fun! How Do You Make Beef Chow Mein? 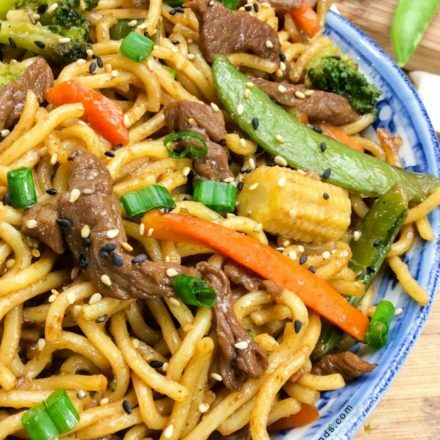 I’ll show you how to make Beef Chow Mein like takeaway (or takeout, as we say in other parts of the world) that’s easy peasy and captures all the textures and seasonings of your favorite Chinese noodle dish. A simple marinade, some boiling water (for softening the noodles), and a simple sauce is all you need to pull off Beef Chow Mein Chinese style. There’s not even much chopping since you’ll use a little help from frozen vegetables, already perfectly sized and seasoned for the recipe. What Is Beef Chow Mein? According to the Beef Chow Mein wiki, there are lots of variations to this dish (though we don’t need the wiki to tell us that). Some have lots of gravy served over crispy noodles, some use big chunks of steak, and some even use cream of mushroom soup. This is a pretty authentic version, with just enough sauce to dress the ingredients, thin, tender pieces of beef, and traditional Chinese flavors and ingredients. Not a can of soup in sight! 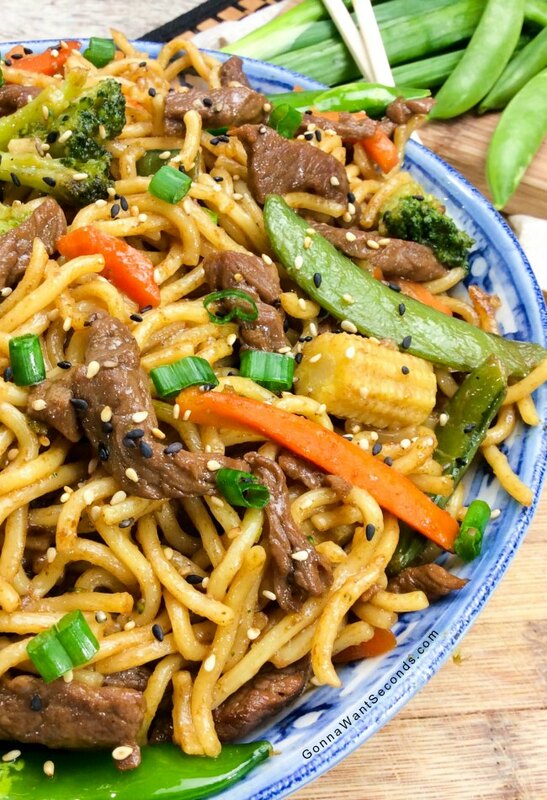 What Ingredients Do You Need To Make Beef Chow Mein? Flank steak is my favorite for this – and any other – stir-fry because it’s lean (which helps with the Beef Chow Mein calories), has tons of beefy flavor, and cooks in about a minute if it’s sliced nice and thin. If you don’t have a butcher who can do that for you (do people actually have butchers?? ), freeze your flank steak for about 15 minutes and it’ll be much easier to cut stir-fry-sized pieces. The marinade’s stupid simple – just soy sauce, rice vinegar, and a little cornstarch. Both the soy and the rice wine bring their own salty/acidic qualities to the marinade, and the cornstarch actually coats the meat a bit to help seal in those flavors. It’ll also help thicken the sauce a bit when everything comes together at the end. Make sure you take the time to cook the flank steak in stages. Too much too fast and the temperature of your skillet will drop. Then the meat juices will start to collect in the pan and you’ll be boiling your steak. Boiled meat means major toughness and the end of a perfect bowl of Beef Chow Mein. The “mein” (Chinese for “noodles”) in this dish are wheat and egg noodles, also called wonton noodles. You’ve likely seen both “lo mein” and “chow mein” on Chinese menus, and both use egg-based noodles, but lo mein can be flat or round and chow mein is almost always round. Both can be served soft, but chow mein is sometimes crispy with the stir-fry resting on top of a crunchy nest of noodles. I’m using a soft version in this recipe. Be sure not to overcook them, and don’t skip the rinsing step. The cool water will stop cooking the process (hooray for not soggy noodles) and eliminate any extra starch left on them that might thicken up the sauce too much. The Veggies: This is one of those recipes that I use a little convenience item for frozen vegetables. Several companies make a seasoned Asian mix that has all the veggies you’d want in a stir-fry, things like broccoli, carrots, sugar snap or snow peas, and those cute baby corn. You can buy the specialty ingredients separately, but I always end up having leftovers, so this is a perfect way to be sure I have exactly the amount I need. Some home chefs prefer a beef chow mein recipe with cabbage, but I think the shredded texture and size really competes with the noodles. Cabbage also has a distinct flavor that I just don’t like in this particular dish, so I just hold onto mine for some future slaw and leave it out of my version. The sauce in my Beef Chow Mein is really where most of the flavors at. There are only a handful of ingredients, but they all pack a powerful punch. There are three in particular that form a tasty triad of chow mein goodness. First is soy sauce, known for the salty, umami flavor it brings. The Oyster Sauce: Next on the list is oyster sauce which is actually made from oysters, the briny essence of those mollusks you either love or hate, concentrated, then mixed with a little salt and sugar. This ingredient is an essential part of Chinese cuisine and adds an earthy depth to the sauce. Although it’s used a lot in noodle stir-frys, it’s a special ingredient not everyone thinks to use (the beef chow mein recipe Food Network stars Ree Drummond and Giada de Laurentiis use skip it). The Hoisin Sauce: The third ingredient is hoisin, a thick, sweet Chinese BBQ sauce flavored with five-spice powder that’s often dabbed onto those beautiful steamed buns (or bao) along with some fresh BBQ pork. 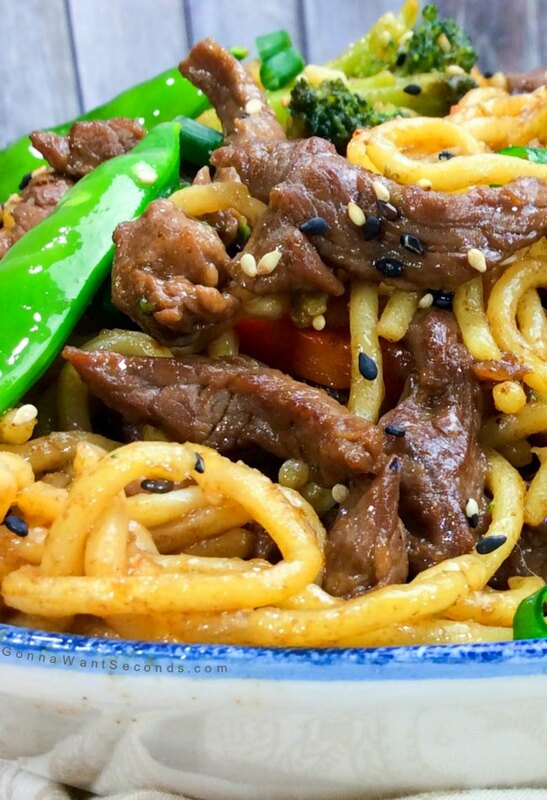 It practically melts into the sauce here, complementing the beef and the noodles as well. We’ll round out the sauce with a little brown sugar and vinegar to create that perfect savory and sweet balance. Everything, including the noodles, gets stir-fried a couple of minutes in the wok, and it’s ready to go. I like to garnish the top with some sesame seeds, toasted if you have time. Some green onions, sliced thinly on the bias, are also great sprinkled on top, both for color and a fresh, spicy crunch. This is such a convincing version of Chinese takeout your guests will be asking for their complementary fortune cookie! Our Easy, Cantonese Inspired, Beef Chow Mein Is Loaded With Crisp Veggies, Tender Beef, and Eggy Noodles. Chinese food right at home! In a large bowl, whisk together the marinade ingredients. Add the sliced beef and toss to evenly coat. Marinade for 30 minutes. Whisk together all sauce ingredients in a small bowl; set aside. Prepare the noodles according to package directions. Rinse under cold water, drain well and set aside. Heat the oil in a 12-inch nonstick skillet over high heat just until smoking. Add half of the flank steak in a single layer. Cook without stirring for 60 seconds. Continue to cook, stirring occasionally, another 60 seconds. Remove to a plate. Add 2 teaspoons oil to skillet and repeat cooking procedure with remaining beef. Remove to plate. Add remaining 2 teaspoons oil to skillet and thawed vegetables to pan and cook until tender-crisp. Add Sauce to the pan and bring to a boil. Add beef and any juice that has accumulated and the cooked noodles and simmer, adjusting heat as needed, until everything is heated through. Adjust seasoning. Other types of beef – Flank should be easy to get your hands on for this recipe, but sliced sirloin will work too. You can also make a ground Beef Chow Mein, though it’s definitely a little harder to eat with your chopsticks! Frozen veggies – If you can’t find the frozen Asian medley, you can substitute another veggie mix that has broccoli in it. If you want to substitute fresh veggies, you’ll need about 3 ½ cups of your favorite combination. Broccoli, bell peppers, yellow squash, sliced shiitake mushrooms . . . you just may need to stir-fry them a little longer to reach the crisp-tender stage since frozen veggies are often blanched before freezing. No noodles – Regular pasta can be used instead of the Chinese egg noodles in a pinch. Spaghetti is probably the closest in size, and you can try this little trick using baking soda to add a little more spring to the noodles so they’ll mimic the Chinese variety. Shrimp Lo Mein– Quick and easy to make at home and it is so much better than any take-out! Dragon Noodle Recipe –Soft lo mein tossed with tender chicken and crisp veggies served with a scorching sauce, perfect to spice up your dinner table! I made the recipe tonight and my daughter loved it. I like it, but it is a little sweet for my taste. Made this tonight and it was delicious. I only rated it 4 stars because I found the taste of the oyster/hoisin combo a bit too strong and savory for my tastes. My husband loved it. Perhaps I’m more suited to teriyaki glaze which I make frequently for salmon teriyaki. I would like to say that using fresh vegetables is so much better than using frozen. I know, the convenience of frozen is nice (and sometimes necessary) but the flavors and crispness of the fresh veggies is worth it. I used broccoli, matchstick carrots, bean sprouts, red pepper, mushrooms, and green onions (I cooked the white parts only and used the green tips raw for garnish). I also commented to my husband that this dish would even be awesome sans meat which is a nice incorporation for our meat eating family. Thanks for the recipe!